Oxymorons litter history. And so do oddities. Why am I telling you all this, you might wonder. It’s simple. The motorcycle in this feature is a heady mix of those two very things. The apparently quintessential thoroughbred British motorcycle brand, Triumph, was founded in 1885 paradoxically by a German immigrant by the name of Siegfried Bettmann. Bettmann originally started the firm in Coventry, England with the sale of bicycles in mind. In 1896, he started another company but this time, in his native Nuremberg back in the Fatherland. However, he took the easy way out and named the company after the British one, and eventually the motorcycles started rolling out in 1903, a year after Coventry started churning them out.Triumph Werke Nuremberg (TWN), as it later came to be known, began its motorcycle lineage by producing bikes with the same four-stroke engines as its Coventry sibling. This continued right upto 1929, after which the Nuremberg and Coventry factories went separate ways. 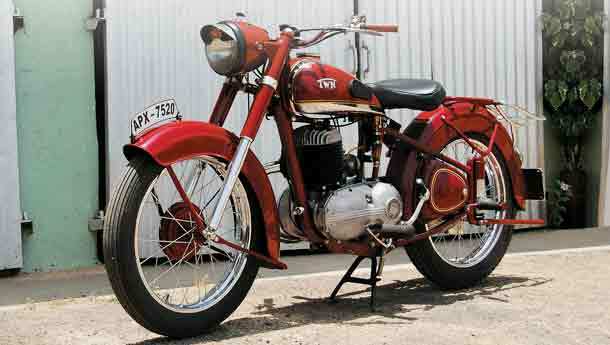 Thereafter, TWN began production of 248cc and 269cc two-stroke motorcycles.Some of these motorcycles included quirky machines like this BDG250. To the uninitiated observer, this motorcycle looks very conventional. But in truth, it is about as conventional as onion-flavoured ice cream or a mid-flight jacuzzi in cattle class. 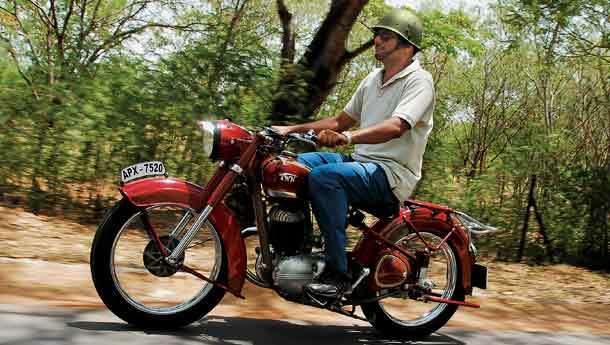 This non-conformist trait lies in its heart, the two-stroker 250cc engine.No, this motorcycle doesn’t run on anti-matter or cold fusion, for that matter. Yes, it’s still an engine that gets its kick from a liquid diet of petrol but that’s where most of the similarities end. In conventional two-stroke engines, some of the fresh incoming air-fuel mixture gets shunted straight across the combustion chamber and then out through the exhaust port along with the exiting burnt gases. In fact, the incoming fresh charge is used to drive out the exhaust gases in a process called scavenging. However, fresh charge used to scavenge results, obviously, in lower efficiency and raises fuel consumption too.This innate drawback in the two-stroke engine was taken care of to a certain extent by the concept of the split single. The split single two-stroke format was used extensively by Ing Zoller in 1931 to bolster the dominant position of DKW (another German motorcycle marque and far more famous) in the Lightweight and Junior catetories in pre-war racing. Coming back to the BDG250, its split engine design employs the use of two individual pistons. The duo are mated to a Y-shaped connecting rod. And in a triumph of division of labour, they both have different jobs outside of absorbing the explosion and turning the crank. One opens and shuts the exhaust port, while the other one handles the transfer port. This allows the exhaust port to open and close before the transfer port, preventing the escape of fresh air-fuel mixture through the exhaust port. Net result were two-strokes with far stronger low and high rev performance and as much as 20 per cent savings on fuel consumption over peers. However, just like a juicy steak is nothing without fries and copious amounts of mashed potatoes, the engine needs to be accompanied by an equally competent frame and other ancillaries. The BDG has its engine mounted onto a single downtube frame which is suspended by telescopic forks in the front and plungers at the rear. Half width drums at either end do sterling service in slowing down the TWN.A tool box adorns the right rear side of the motorcycle while the chain runs in a fully-enclosed stylish-looking chain cover on the right side. Deep mudguards hug the wheels and a chromed tail light sits below an emblazoned ‘TWN’ on the rear mudguard. A deeply chromed fish-tail tipped exhaust sweeps away the exhaust fumes from the engine. After taking in the sweeping lines of the bike, I swung my legs over the saddle. The saddle has special mention here because the seat is damped by a big block of rubber, and not with springs like the other motorcycles of its vintage. I bounced onto it a couple of times merrily till I realised that the owner, Colonel Shashidharan, was just an arm’s length away and could put me into a coma in the blink of an eye if I irked him too much. Oops, sorry about that, sir!When finally settling down onto the saddle, I noticed that the instrumentation is very spartan with just one bulb (headlight high beam indicator) and a very simple speedometer, in addition to the push-on-pull-off ignition switch. The meter itself is original but has been refurbished, albeit with some recent ‘Hyderabadi’ (as the Colonel put it) styled stickering within. Starting this machine is child’s play and it gets into the typical period two-stroke idle splutter instantly. No, I didn’t mean any disrespect with the ‘splutter’ bit. 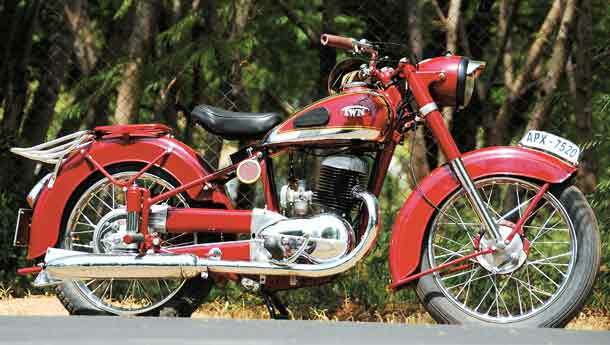 I just said it because the BDG250 sounds like a duet sung by a Rajdoot and a Jawa and the result is a very sweet sound ‘pitter-patter’ – music to any two-stroke enthusiast’s ears. I didn’t ride the TWN extensively but from what I observed, it was quite a well-mannered machine. This probably was the motorcycle the friendly guy next-door in your ‘Stadt’ would get around town on. It seemed to be virtually indestructible and would probably survive a blitzkrieg unscathed. I know, I know, maybe I should lay off the German lingo! The motorcycle handled well and the meagre potholes I encountered didn’t trouble it at all. The bike kept pace with the early morning Hyderabad traffic effortlessly and stopped without any protest. I didn’t get too many curious glances, although I’m sure that had I been riding in peak hour traffic, there would have been dozens of heads popping through windows to catch the sight of this outlandish looking machine on the road.A special mention must be made about this motorcycle’s originality. No corners have been cut in its restoration and the result is hard to find flaws with. Colonel Shashidharan’s BDG250 is so intact that it still retains the engraved name of the official importers for TWN in Hyderabad, ‘Fram & Company’, on the crankcase!